Makes 6 to 8 single-serving pies. I grew up with chicken pot pies. However, my mother bought them pre-made and frozen. One important ingredient for me was a bottom crust. 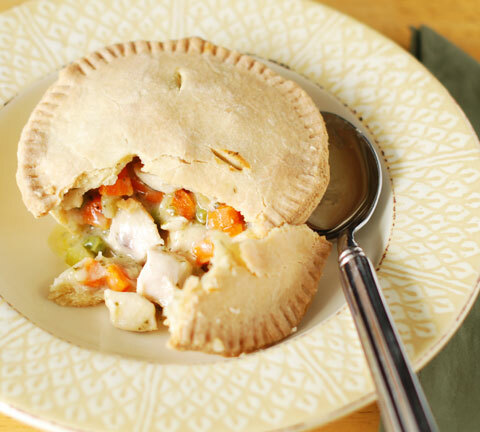 Many pot pies are made with only a top crust. If my pot pie didn’t have a bottom crust I felt cheated. So for this recipe I made enough pastry dough to give each pie a top and a bottom crust. I used small 5-inch (13cm) pie pans. To Prepare the Pastry: In a large bowl whisk together the water, salt, and eggs. Add 1½ cups (340g) softened butter and whisk until the butter is broken up into small beads. Add the flour and combine with a large spoon until the mixture is dry enough to knead. Transfer to a work surface and knead, pressing together, to form a smooth dough. Cover with plastic and set aside until needed. To Prepare the Pie Filling: Slice the chicken breasts lengthwise into two broad slices. Heat oil in a skillet and add the chicken. Sauté over medium heat until lightly browned. Turn and continue until the meat is just cooked through. Remove from the pan and set aside. Leave the oil and fond (the brown bits) in the skillet. Dice the onion, celery, and carrot into ¼-inch (1cm) pieces, about the same size as the peas. Cook in the skillet until tender, 4 to 5 minutes, and then transfer to a bowl and set aside. Cube the chicken into bite-size morsels, slightly larger than the vegetables. Add to the cooked vegetables. Melt the 4 tablespoons butter in the skillet. Add the ½ cup flour and stir, cooking the flour 1 to 2 minutes. It will be lumpy. Add the chicken stock and stir until the flour is broken up and incorporated into the stock. Add the peas and simmer 2 to 3 minutes over low heat. The sauce will thicken. Remove from the heat and stir in the cream. Add the cooked chicken and vegetables, parsley, sherry, and thyme. Adjust for salt and pepper. Heat oven to 400°F (200°C) with a rack in the lower third of the oven. Combine the 1 egg with a teaspoon of water to make an egg wash. Divide the dough in 6 or 8 equal-sized sections, enough for your available small pie pans. Divide each piece into a 1/3 and 2/3 portion. Roll the larger portion into a bottom crust and gently ease into a pie pan. There should be plenty of dough extending beyond the edge of the pan. Spoon enough filling into the pie shell to fill it to the top. Roll the smaller portion to form a top crust. Brush the edges of the bottom crust with egg wash and press the top crust into place, sealing around the edges with your fingers. Trim with a knife and then press the tines of a fork into the edge all the way around to decorate. Pierce the top crust in 3 or 4 places to create vents. Brush the tops lightly with egg wash. Arrange the pies on a lined (foil or parchment paper) baking sheet and bake 30 to 40 minutes until lightly browned and the filling mixture begins to show signs of boiling up through the vents (or out the sides). During the last few minutes of baking the pies can be browned lightly under the broiler. Watch them closely. Cool 10 minutes and serve by removing pie from its pan and placing in a shallow bowl.